Self-sustaining + tranquil landscape w/ man-made riparian creek, perennial garden + low-maintenance fruit orchard w/ bee-friendly micro-clover meadow. 'Dura-Heat' River Birch [Betula nigra 'BMNTF'] creates dappled shade over a dry natural creek feature. A steel + concrete bridge crosses a dry creek feature lined with drought-tolerant plantings + granite boulders. A segmented concrete path compliments the natural garden setting. A recirculating water feature emerges from beneath a steel bridge. A Japanese Maple + riparian plantings accent the granite boulders at the water's edge. 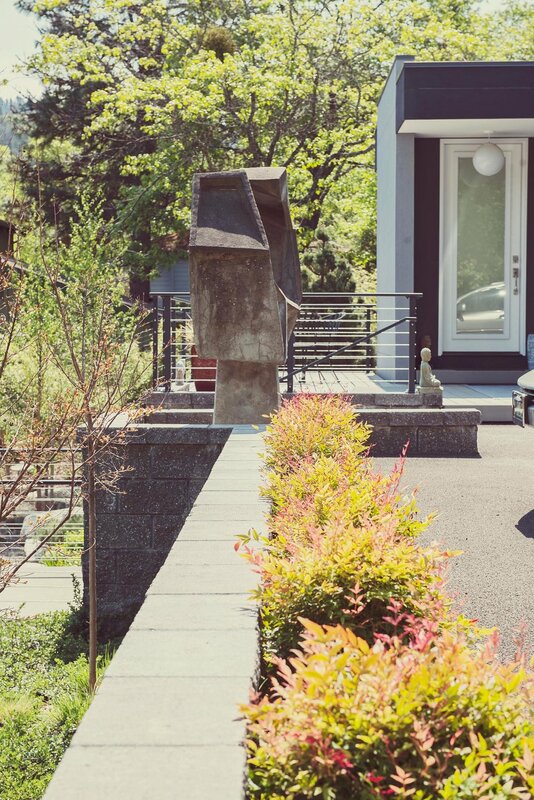 Heavenly Bamboo [Nandina domestica] line the drive of this modern + artistic guest house. A segmented concrete pathway leads through a drought-tolerant perennial garden to a concrete bridge spanning a riparian water feature. Two sides of a man-made riparian creek bed are connected by a concrete slab bridge. Water lilies gather in a man-made granite boulder creek bed w/ modern riparian plantings: Japanese Bloodgrass [Imperata cylindrica], Japanese Maple [Acer Palmatum], + 'Blue Zinger' Sedge [Carex flacca]. Mass-planted lavender borders a modest deer fence made of Juniper and rusted steel mesh. Raised cedar beds with steel edging + grape vine trellises provide space for a personal backyard vineyard. Basalt gravel pathways separate the terraced beds. Apple trees planted in a meadow of micro-clover create a low-maintenance, pollinator-friendly environement. 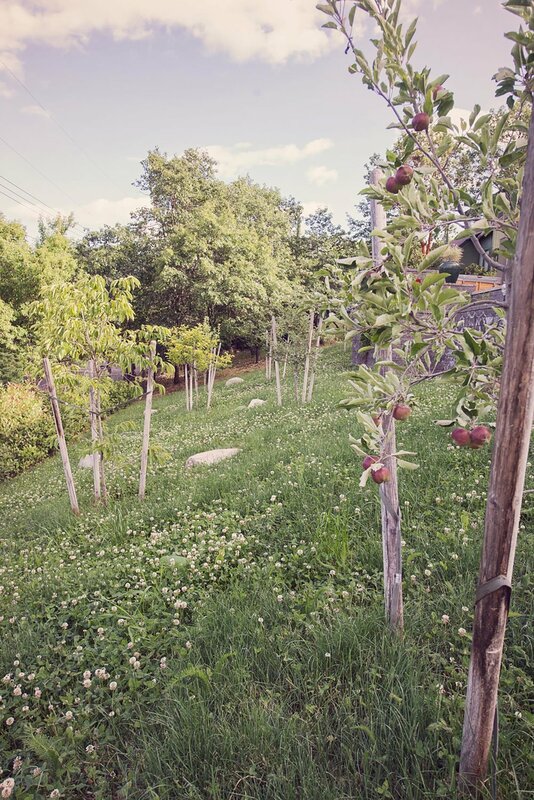 Orchard trees with a bee-friendly micro-clover meadow + scattered granite boulders create a low-maintenance front yard, maintaining beautiful mountain views. This high-altitude property received a multi-phased transformation into a self-sustaining landscape surrounded by deer fencing. 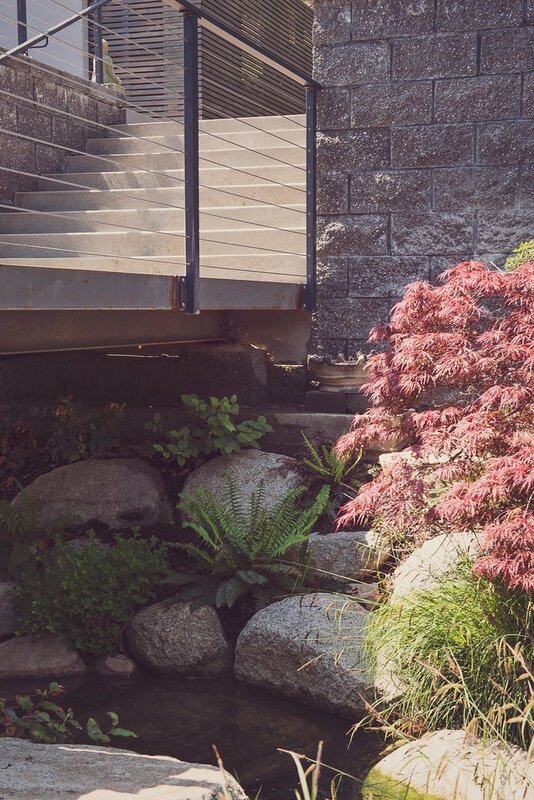 A segmented concrete pathway leads through an inviting garden gate to a tranquil man-made boulder creek, complimented by River birch, Japanese Maple, and riparian plantings. A steel bridge allows for ease of movement between the main residence and guest house. Grape trellises and raised vegetable beds equip these hobbyist gardeners during the growing season. A low-maintenance front yard filled with fruit trees, bee-friendly micro-clover, and scattered granite boulders maintains beautiful mountain views from the main deck above.